Fortunately this notch wasn’t caused by too many bacon cheese burgers, but rather lots of studying. Upon earning my 22nd ASE certification, the gears started spinning in my little brain and I wondered about the general public’s understanding of exactly what ASE certification is. ASE’s website has a great deal of information including statistics detailing how many technicians are certified in which categories if you want to learn more. 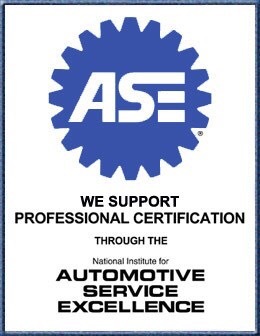 A while back I wrote an article about some of my ASE certifications and I’ve spoken to a few different people in the automotive industry concerning ASE certs. Some think it’s very important and a great feather in your cap while others think they’re next to useless and couldn’t care less. The latter often feel that manufacturer (GM, Ford, Nissan, Chrysler, Honda, etc.) certs are more important and marketable. Personally, I feel ASE certifications are important but they have to be considered as only a part of your resumé. ASEs can be a great gauge of your level of knowledge and skill, but they’re not a fool-proof litmus test. While it is true that you are required to show proof of work experience (ranging from 1-3 years minimum depending on the cert. ), one who is very “book smart” and a good test taker could pass them with flying colors given a sufficient amount of time studying. ASEs have always been an important part of my life and I feel they have opened doors to me that might not have otherwise been accessible. I will continue to keep my certs current and do my dead level best to keep up with the newest tests (the L3 hybrid vehicle test, for example) because even if it doesn’t mean a thing to anyone else, it means a lot to me. It means a lot to me because I know how much work I put into earning those certifications and I know how few other techs have all the combined certs I have. Personally, the ASEs are for me, no one else, and that’s the way I think it should be. Comment below with your opinions!